General inquiries are usually answered within first couple of hours. If you did not receive confirmation email with your license key please check your spam filter. If it is not in the spam filter, please contact me for assistance. Feel free to send me your success stories and endorsements. I will post the name of your business and what you do on my web site. Tell your friends and colleagues about it. We don't advertise, so word of mouth is how people are getting to know about this software. HSMAdvisor/FSWizard Software is made by a professional CNC Programmer/Machinist. My name is Eldar Gerfanov. I currently am a full-time software developer. 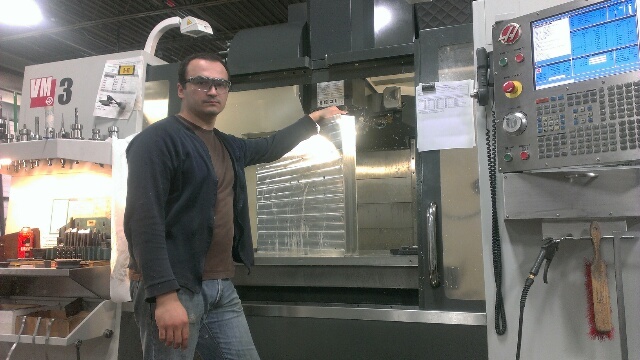 I have more than 10 years or professional manufacturing experience and have worked for several aerospace, mold-making and prototyping shops. Having made my way up from a manual machinist to a CNC Programmer/machinist i have long felt the need for an affordable software that could confidently output starting point cutting parameters for both milling and turning. Existing at the time applications would either not fully consider cutter geometry, output cutting parameters that were plain wrong or be unaffordable due to one-sided subscription payment models and internet connection requirements. Thus FSWizard - the first ever such Free online Speed and Feed calculator was launched. It was the first and still the only online application to attempt scientific approach to Material Removal and Speeds and Feeds. After being well received by an online community i have decided to port this calculator to a standalone computer program called HSMAdvisor. HSMAdvisor has much more powerful algorithms that help users get the most productivity out of their machines and a cutting tools. As name suggests, it fully supports latest HSM machining techniques. But HSM is not all it can do. General Machining, Drilling, Tapping, Turning. It does it all. It is meant to empower CNC programmers and machinists with reliable tools that allow them to produce part programs that require the least amount of manual tweaking and following operator attention. This results in reduced amount of downtime due to program re-writes, corrections, broken tools and even prevents machine crashes. My software is NOT sold only by subscription. I myself do not fully embrace subscription-based software. Also many work place stations are not connected to the internet, so such system would prove extremely troublesome. However many potential customers wish to spread their payments over a longer period of time. Thus it has been decided that we will be offering both the subscription packages and those that do not require further payments as well. Support is free for users of all versions of my software whether paid or not. I offer you my expertise to answer your questions regarding the use of my software. I can also help you answer general machining questions whether it directly relates to use of my software or not. Being a former professional machinist and now a full-time software developer, i do not depend on sales for my income. This helps me keep prices low and my wife-accountant happy! The dream of my life is to have a hobby and be paid for it. My promise is honesty and hard work.